SPOILER ALERT (if you are reading Pride’s Children as we go along, you may want to skip this one for now.) This is my WRITING blog, and some viewers may be more interested in my odd techniques than in my stories. I think of WRITERS’ BLOCKS as objects in my path I need to blast through to get to where I’m writing. 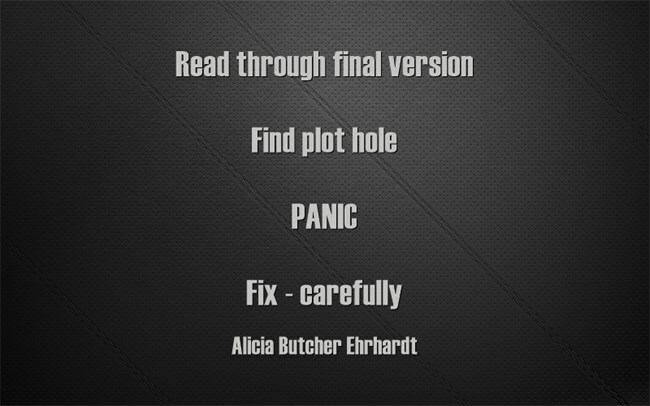 This entry was posted in Writing - how to and tagged plot holes, the creative process, writing on July 15, 2013 by Alicia Butcher Ehrhardt.